The name HMS Vanguard is associated today with the Royal Navy’s last battleship, scrapped in 1960. An earlier Vanguard was however to meet an even more unpleasant fate, and arguably a wholly avoidable one. The HMS Vanguard launched in 1870 was one of a class of four ironclads, her sisters being Audacious, Invincible and Iron Duke. The concept of a sea-going ironclad capital ship was only ten years old. 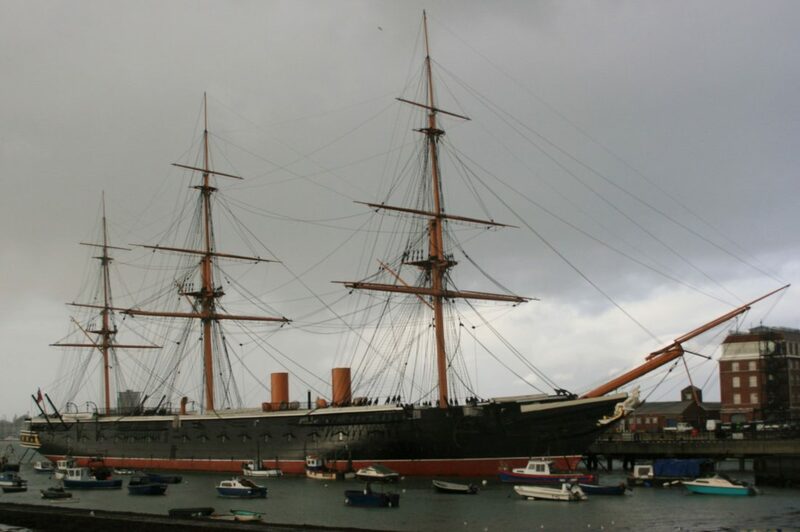 HMS Warrior, the first of the type, and which was as revolutionary in her time as HMS Dreadnought four decades later, had become the starting point for a new type of warship. The Vanguard and her sisters represented a second generation of such ships. Their most notable departure from the Warriorconfiguration was that although Warrior carried her many guns in broadside mountings, as warships had done for centuries, the Vanguard’s armament of much heavier weapons was concentrated in a two-storey armoured box amidships. 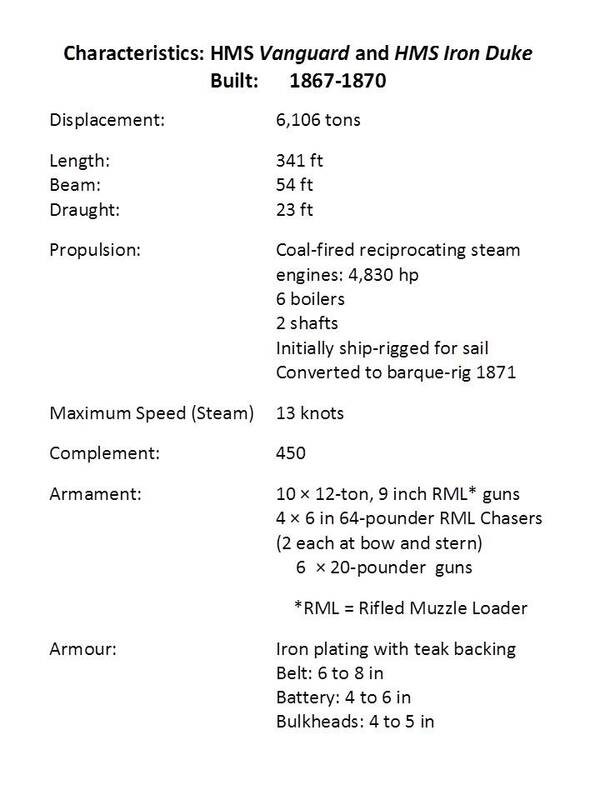 Vanguard and her sisters (see table) were rated as “second-class”, of moderate dimensions that were well suited for deployment on foreign stations, most likely singly. 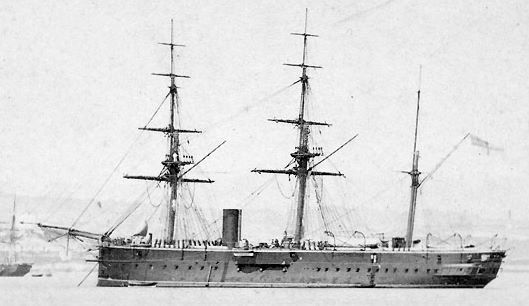 Iron Duke was to serve as flagship of the China Station for four years from 1871 and was one of the largest ships to transit the Suez Canal up to that time. Her sailing rig made her particularly suitable for operations in areas, such as the Pacific Ocean, where coaling opportunities were limited. All four vessels of the class were described as “good and steady seaboats but slow under sail”. By 1875 Iron Duke had returned to home waters and was assigned, with her three sisters, with the ironclads Hector, Defence, Penelope and Achilles, and the by-then obsolescent Warrior, to the First Reserve Squadron. In late August the squadron was based at Kingstown (now Dun Laoighaire) the large artificial harbour on the southern side of Dublin Bay. On the morning of September 1st the Squadron left Kingstown in line, the majority of the vessels headed for Queenstown (now Cobh) further south on the Irish Coast. This enormous force, splendid with their black hulls and buff funnels and masts, must have been a magnificent sight as they passed, one by one, through the narrow-gap between Kingstown’s two projecting mile-long piers. Six miles out, off the Kish Bank lightship, the Achilles broke away to head for Liverpool and the remaining ships turned south. The sea was moderate, but a fog came on, its density increasing. The ships had been proceeding at some twelve knots, but speed was reduced to half this as the fog persisted. By a half-hour after noon the lookouts on Vanguard could not see more than fifty yards ahead, and the officers on her bridge could not see the bowsprit. It is unlikely that the situation was any better on the other ships. The Vanguard’s watch suddenly reported a sail ahead, and the helm was put over to prevent running it down. 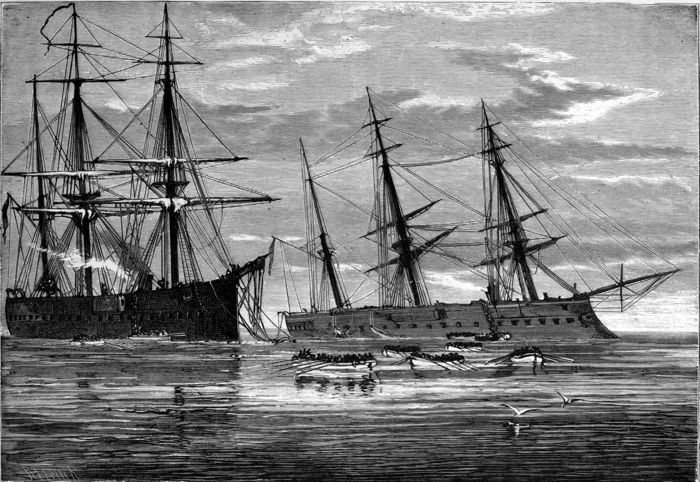 The Iron Duke was then following close in the wake of the Vanguard, whose action brought the two vessels closer, presenting Vanguard’s port broadside-on to Iron Duke’s bow. Unaware of any change, and blinded by the fog, the Iron Duke ploughed on. Only at the last moment did her commander, Captain Hickley, who was on the bridge, see Vanguard emerging from the mist. He ordered reversing of his engines, but it was already too late. The Iron Duke’s ram struck the Vanguard below the armour-plates, on the port side, abreast of the engine-room. The rent made was very large—amounting, as the divers afterwards found, to four feet length —and the water poured into the hold in torrents. It was immediately obvious that Vanguard was doomed for this was still an age when compartalisation and damage-control of iron vessels were in their infancy. There was nothing more to be done but to save lives. 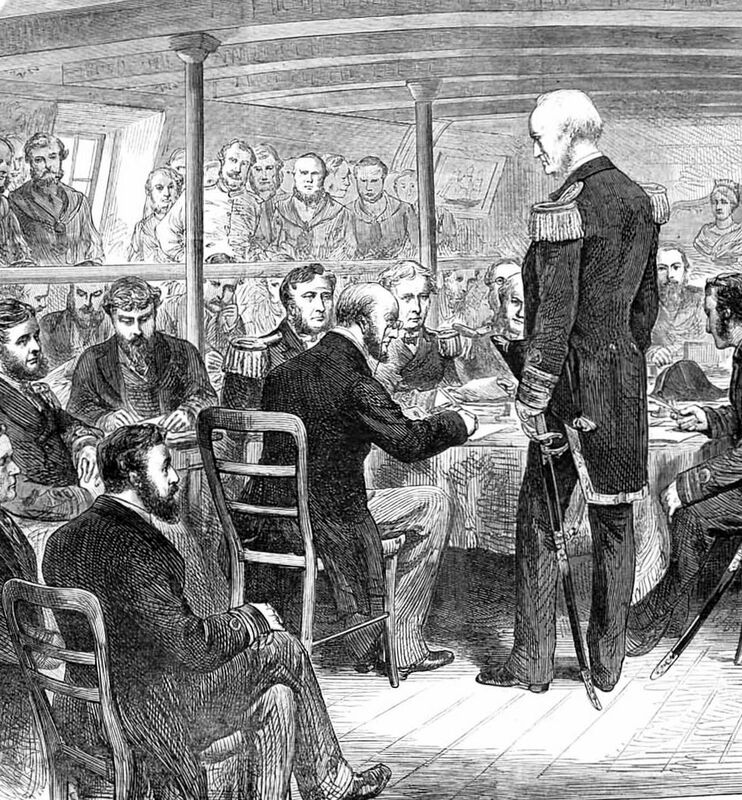 The Vanguard’s Captain Dawkins ordered abandonment and officers and men behaved calmly. At the risk of his life one of the mechanics returned to the engine-room to blow down the boilers, so preventing an explosion,. The water rose quickly in the after-part, and rushed into the engine and boiler rooms, eventually finding its way into the provision-room flat, through imperfectly fastened “water-tight” doors – which proved anything but. Discipline was superb, the crew standing on deck as if at an inspection and not moving until ordered. 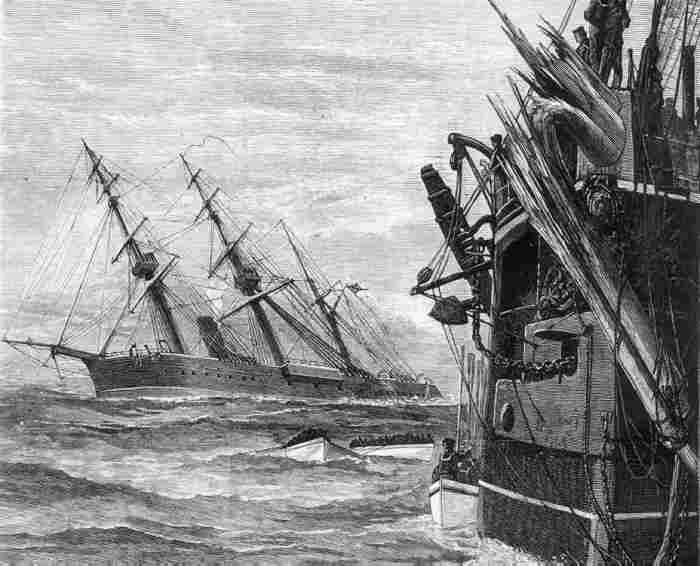 Boats were lowered by both Vanguard and Iron Duke and in the process of transfer the only casualty of the disaster was sustained – a finger crushed between a boat’s gunwale and a ships’ hull. The actual transfer to Iron Duke of Vanguard’s entire crew was achieved in twenty minutes and Captain Dawkins was the last man to leave her. Vanguard heeled gradually over until the whole of her enormous flank and bottom, down to her keel, was above water. Then she sank gradually, righting herself as she went down, stern first, the water being blown from hawse-holes in huge spouts by the force of the air rushing up from below. She disappeared some ninety minutes after the collision. The inevitable court-martial was to prove remarkable for the statement by the then First Lord of the Admiralty – the minister responsible for the Navy – that “we ought to be rather satisfied than otherwise with the occurrence”. 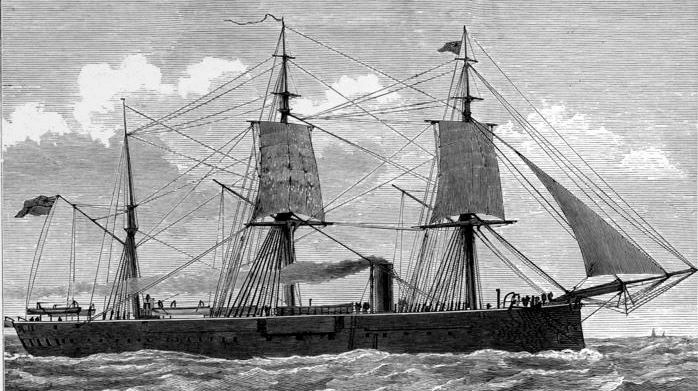 Edward Reed, the designer of both ships, and by 1875 a Liberal Member of Parliament, stated that ironclads were in more danger in times of peace than in times of war. In peacetime, he said, they were residences for several hundred men, and many of the water-tight doors could not be kept closed without inconvenience. In wartime however they were fortresses, and the doors would be closed for safety. Even more remarkably, close station-keeping in a fog was not considered as contributing to the disaster. The Court commented negatively on the conduct of the Iron Duke’s officers and indirectly blamed the admiral in command of the squadron. The Admiralty could find nothing wrong in either case and visited their wrath on the unfortunate lieutenant on deck at the time. Vanguard still lies, largely intact, in some 150 feet of water off Ireland’s Wicklow coast. She is reachable by experienced air-divers – and reaching her must be a magnificent experience. And Vanguard’s Captain Dawkins? It’s sad to report that, well as he behaved after the collision, his career was at an end.